Yokozuna (ヨコヅナ Yokozuna) is a giant sumo-wrestling frog, who was a friend (as well as pet) to the legendary shipwright Tom until Tom&#039;s execution. After that, he would always swim through the waters around Water 7, stepping in the way of the Sea Train to try and stop it. This habit is said to be caused by Yokozuna wanting to become stronger so he won&#039;t lose anymore of his loved ones. 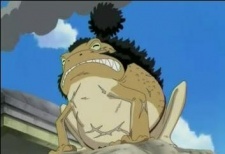 In fact, when he was first introduced, he was performing this very routine when Zoro spotted him from the Going Merry; after informing the rest of his crew about the giant frog swimming in a manner not unlike to a human, Luffy decided to slightly change course (they were headed to the next island, which happens to be Water 7) to capture the giant frog so his crew could have a nice barbecue meal. This habit also caused him to try and stop the Rocket Man while the Straw Hat Pirates, Galley-La Foremen, and Franky Family were traveling towards Enies Lobby, and he ends up helping them in their attempt to get Franky and Nico Robin back. While on Enies Lobby, he is in charge of preventing any government agents from getting into the courthouse, and does well until the Jurors arrive and attack. He is then saved by the giants Oimo and Kaashii, who decide to help him guard the courthouse. Yokozuna boarded the sea train with the Franky Family, the Galley-La, and the giants and has since returned to Water 7. He was recently seen in a "where are they now" title page, no longer challenging the Sea Train. Franky taught Yokozuna to use crawl-stroke when swimming.